I learnt Emma’s story when I visited the English Heritage Ladies of Kenwood exhibition in Wellington Arch. One of the portraits on display was of Emma Hart at Prayer, and beside it there was a brief story about a woman who had been a mistress and become a wife. Of course I was fascinated so I had to find out more. Emma was linked to Kenwood because she’d married Sir William Hamilton, a friend of the 2nd Earl and Countess of Mansfield but Lord Mansfield did not approve of his wife spending time with Emma. She was born on the 26th April 1765, the daughter of a blacksmith and called Amy or Emy Lyon. She was raised by her mother as her father had died when she was an infant, and in her young teens she was already in London earning a living through her beauty. There are a few conflicting tails of how she was earning her living then. Some reports say she was the maid of an actress in Drury Lane but several concur that she spent time in a ‘temple of health’ more like a brothel. Although one report declares her role within the-quack-Dr Graham’s ‘Temple of Health’ was to pose as a living illustration. The first man to secure her sole attentions was Sir Harry Featherstonehaugh of Uppark in Sussex. That relationship did not last long as Emma fell with child and Harry instantly abandoned her. But from here on Emma’s fortunes improved. With her looks it did not take her long to find another man, The Hon. Charles Greville. At this time Emma was still only sixteen. Her child was sent to relatives in the country and Charles Greville took her as his paid mistress, setting her up with a house in Paddington Green where he may visit her often. She resided there as Mrs Emma Hart. No longer known as Amy Lyon. In April 1782, Charles Greville decided to have his beautiful mistress painted for posterity and took her to the studios of George Romney. The artist fell in love with her. I have said before, it was a symptom of this era that man felt a need to be romantically inclined. Men competitively fawned about women, seeking their favour and women who lived on their looks encouraged it and flirted and hinted and teased right back, massaging men’s egos for all it was worth. 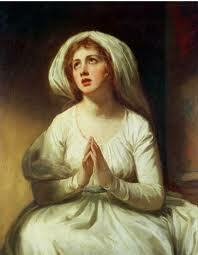 Emma became George Romney’s addiction, in four years she sat a hundred times or more for him. He called her his muse and he painted her in numerous poses, finishing sixty paintings in total and becoming distracted from his more beneficial commissions. In August 1783 Emma met her future husband. Charles Greville’s uncle. He was the British Envoy in Naples, and he had returned to Britain with the remains of his first wife who he wished to bury in England. He enjoyed spending time with his nephew’s mistress and was as charmed by her as Charles and George Romney had been. He named her his ‘fair tea maker of Edgware Row.’ Lord Hamilton saw a Greek Goddess in Emma, thinking of the beautiful Roman and Italian sculptures he lived amongst in Naples. 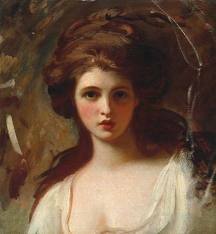 He commissioned Reynolds to paint her as bacchante and he took the portrait home with him when he returned. In 1785 Charles Greville wrote to his uncle – Charles was Lord Hamilton’s heir – complaining that he had financial difficulties. 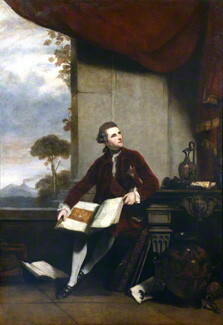 Lord Hamilton’s response was that Charles must marry and he must marry a women with a dowry not below £30,000 per year. Of course the other obvious implication was that Charles could no longer afford to keep Emma and he must give her up. The letters which passed between London and Naples, between nephew and uncle, slowly developed a plan unknown to Emma. If Charles’s uncle took Emma then Charles would be released of his obligation to maintain her (most contracts with courtesans contained clauses for a separation fee and a future income once the woman was cast off, often men did not pay it). The other benefit to Charles was that if his uncle was distracted by a beautiful young mistress he may never remarry and if he did not then it was more likely Charles might have his inheritance. If his uncle remarried there may yet be sons who would stand between Charles and any hope of his inheriting his uncle’s fortune. 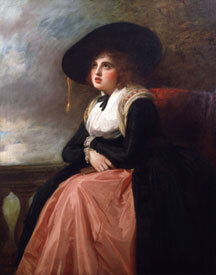 Emma left London in 1786, alone, packed off to Naples by Charles Greville and leaving a grieving George Romney behind. 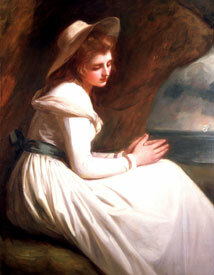 George Romney painted two pictures to express his grief. The first is of Emma, his ‘English Rose’ in the cavern’s of the Neapolitan coastline, looking heart-sore because he imagines her missing London. 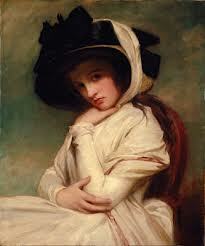 The second was Emma in mourning dress, expressing George Romney’s own grief at the loss of his muse. There is no doubt that Emma was passed from Charles to his uncle with out her consent, because letters are in existence which confirm her confusion. Three months after she had arrived in Naples she wrote to Charles. She had been waiting for his arrival. She had thought only that she had gone ahead of him and that he was to join her. She did become Lord Hamilton’s mistress within six months, although her letters still recorded that she pined for Charles. It was not her choice at the time. Emma married Lord Hamilton on a return visit to London in 1791, she was 26 and he 61 and by this point she had clearly grown accustomed to her fate as she is recorded as writing to Charles Greville ‘I love him tenderly.’ Before she married during her stay in London George Romney had her sit for him many times but after her marriage she never sat for him again as Lord Hamilton forbade it. She was never accepted in English circles because she was considered too vulgar but in Naples her celebrity grew, and in August 1793 she met Admiral Nelson and played a part in securing the Kingdom of Naples allegiance with Britain through association with the Queen. Both Hamilton and Nelson believed her influential in the agreement. 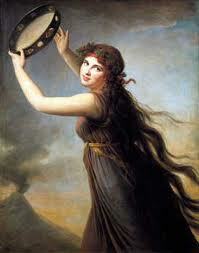 After this Lord Hamilton fell ill but Emma continued performing her ‘attitudes’, though she also grew in size. It was in 1798 Emma began her last and most notable affair. Wounded with one arm amputated and blind in one eye, following his defeat of the French in Aboukir Bay, Nelson wrote to the Hamiltons. ‘I trust my mutilations will not cause me to be less welcome.’ Of course Emma would welcome the Hero of the Nile and she prepared a lavish welcome. Emma was responsible for nursing Nelson back to health, as a maid and a mistress while Lord Hamilton treated Nelson as a friend and like a son. The lived ménage-à-trios for eighteen months in Naples, with Nelson’s ships in the bay responding to occasional action and when he helped the King and Queen flee to the safety of the court at Palermo, he took the Hamiltons with him. But rumours of their scandalous relationship were spreading. Emma became known for her drinking and her gambling and when she played at tables Nelson would always be seated directly behind her watching. In June 1800, Nelson claimed to be too ill to continue in his post and although he had a wife in London, he remained mostly with the Hamiltons. 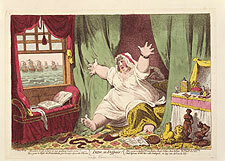 The cartoon below was drawn by James Gillroy in 1801, and depicts Emma in a classic attitude of despair, with her husband sleeping behind her while she looks out at Nelson’s departing ships, while spread about the floor are phallic symbols her husband was known to show an interest in, and emblems of her former beauty in statues. However more fool Gillroy for Emma’s size at the time was in part due the fact she was secretly carrying Nelson’s child, Horatia. When Lord Hamilton died in 1803, Emma then lived with Nelson until he died too. In his will Nelson entrusted Emma’s care upon the nation. But George III wanted nothing to do with such an embarrassing social climber, especially as by this time she was a drunk and had a habit of displaying herself in public inappropriately. As with other stories of women who lived upon their looks Emma’s end was not happy at all. She fled to Calais and died of alcoholism. Posted on October 29, 2012 by janelark •	This entry was posted in Georgian Stories, Scandalous Women and tagged 1700s, 1800, 1800s, 18th Century, 19th Century, Admiral Nelson, author, Charles Greville, Emma Hart, George Romney, georgian, history, Jane Lark, Lady Hamilton, Lord Hamilton, Nelson, novels, regency books, writing. Bookmark the permalink.